U Wai Phyo, vice president of the Union of Myanmar Federation of Chambers of Commerce and Industry (UMFCCI), said that the country needs to open up for foreign investors and at the same time support domestic players in the wake of increasing competition. He was speaking at a press conference during Invest Myanmar Summit 2019, the first official investment conference organised by the National League for Democracy-led government. 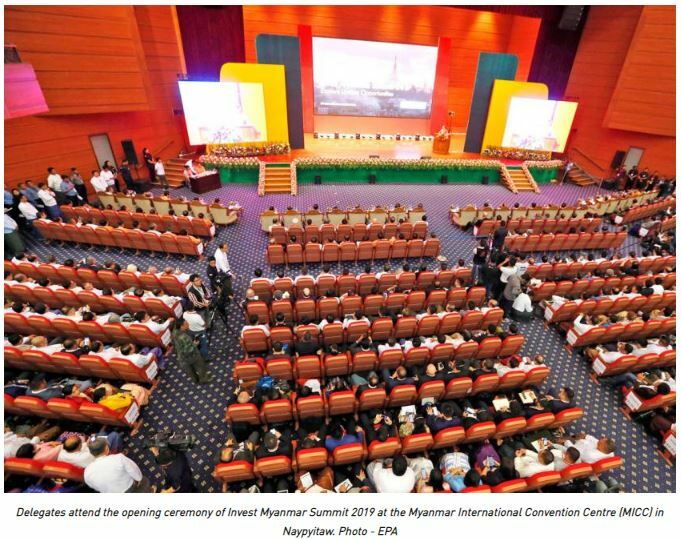 The summit was intended to bolster support for Myanmar’s economy and it provided a platform for 10 states and regions to showcase their investment opportunities. “Liberalisation is necessary for economic growth,” he commented, conceding � that the country can only attract investments and grow if the economy is more open for foreign capital. Local companies are generally wary of foreign competition. For example, the Myanmar Retailers Association (MRA) insisted that there should be further limits imposed on non-Myanmar firms to fend off foreign competition despite the considerable restrictions currently in place. Many sectors in Myanmar remain heavily protected, for example, the Transport Ministry rejected two airline joint venture proposals in the last 14 months. International investors, both European and Asian, have grown increasingly frustrated with the NLD-led administration’s slow pace of reform and protectionist policies. Around half of the European firms in a recent survey conducted by the European Chamber of Commerce in Myanmar said economic protectionism has had a negative impact on their operations. Responding to a question on the sluggish reform from The Myanmar Times, U Wai Phyo stressed that policy implementation and law enforcement are as important as passing new laws, and that the bureaucracy’s lack of capacity to manage infrastructure development and deliver on practical reform is a challenge. The business leader added that the ability and willingness of bureaucrats at a lower level of government to understand and deliver on the policies is also a key factor. Other priorities for the administration should include better coordination between ministries and government entities, as well as modernising the bureaucratic working culture. “However, I think we are getting better,” U Wai Phyo went on, adding that technological upgrade and transparency will improve the administration’s ability to carry out reforms. The business group’s sentiment survey for 2018’s second quarter showed that the economy was hit by a volatile exchange rate, limited access to banking services and high taxes. Now that the currency rate has stabilised, U Wai Phyo said the economy set to grow in 2019. “We have stability in the currency. I think that will [benefit] the economic outlook,” he commented.